My first port of call in Africa: Johannesburg! Everyone who I spoke to basically said that Johannesburg was dodgy and that Cape Town was the better city and that any time I was going to devote to Joburg should be diverted to Cape Town. And they were pretty much right. But due to flight times, I ended up with a full day in Johannesburg, and I’m super glad I did. My hostel organized a full day tour for me to all the main sights. Top of Africa: The Carlton Centre in downtown Joburg is the tallest building in Africa and has been since 1973. It’s somewhere between a quarter and a third of the height of the Burj Khalifa, so it’s honestly not that impressive. Also, the building itself was pretty ugly on the outside… and inside. The top floor has an observation deck with views of Johannesburg, which is honestly not a pretty city from above. Five minutes later, we were ready to go. Soweto: Soweto is abbreviation of “South Western Townships” and is the most famous and most visited township in all of South Africa. It is here where Nobel Prize Winners Nelson Mandela and Desmond Tutu live(d), and it contains many of Joburg’s main attractions. It is here where my day took a very quick turn toward somber. Soweto used to be where the black population was forced to live away from the whites in the nice parts of town. Since the end of apartheid, many blacks who have earned a good living have opted to stay in Soweto and have gentrified parts of it. Driving around, we saw some very nice homes, some very middle class homes, and some obviously poorer sections. The worst, however, was what the locals call the “informal settlement”. The informal settlement is just a nice way of saying shantytown. A local 20-something who runs a charity for the informal settlement took us around the area on foot. We got to see where he lives – in a small two-room shack with ten other family members. It was depressing. While in Soweto, we also visited Walter Sisulu Square with its 10 Pillars of Freedom, Nelson Mandela’s house, and the Hector Pieterson Memorial, in honour an innocent 13-year old boy who was ruthlessly killed by police during the 1976 Soweto uprising. Apartheid Museum: Just when I thought the day couldn’t get any sadder, we went to our final destination: the Apartheid Museum. This in-depth look at apartheid was the highlight of the day and the place I had been most looking forward to visiting in Johannesburg. The museum takes visitors through the entire history of apartheid, including a look at pre-apartheid South Africa and a bit about post-apartheid South Africa. I spent roughly two hours inside because that is all I was given, but I reckon I could spend an additional two hours easily. There was a huge amount of information inside. That night, I met up with a friend of a friend for dinner and drinks. I got to see another side of Johannesburg: the fancy side. After dinner at a Japanese restaurant, we wandered to a very posh bar for some wine and a bit of dancing. In retrospect, the whole first day really summed up my impression of South Africa in its entirety: some really nice parts mixed in with a lot of sad parts. I will blog more about my experiences in South Africa later on, but first I had four other countries to check off my list. 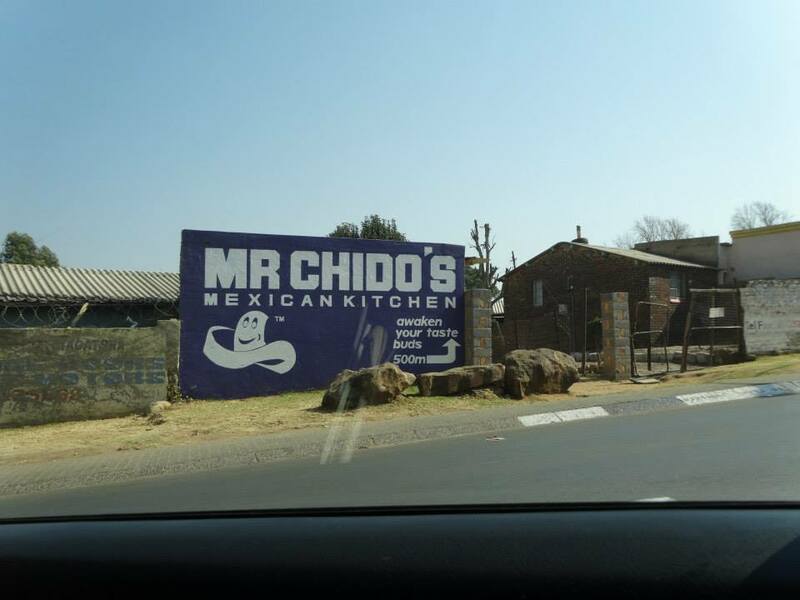 Proof of Soweto’s gentrification: a Mexican restaurant. They knew I was coming.